Dwell and Sausalito–based Heath Ceramics have more than a few things in common. We're both design-focused Bay Area companies. We both have a dedication to modernism. And we both provide tools for smart, sustainable living. Now, our two companies' philosophies will come to life for the first time as an exciting product collaboration: Dwell Patterns by Heath Ceramics, which will debut Friday, June 25 at Dwell on Design. The story of Dwell Patterns begins where probably no other story does: In the security line for the White House. At last year's Cooper-Hewitt National Design Awards luncheon, husband-and-wife Robin Petravic and Catherine Bailey, who purchased Heath Ceramics in 2003, found themselves shuffling through the metal detectors with fellow honorees Dwell founder Lara Deam and her husband, designer and architect Christopher Deam. "We've known Chris and Lara for a long time but it wasn't until we got there that we actually had time to talk," marvels Bailey. Later, as they were seated at the same table during a lunch hosted by Michelle Obama, the four began to formulate a plan to collaborate on a project in the next year. Dwell is proud to announce a new line of architectural tile produced as a collaboration with Heath Ceramics. Back home in San Francisco, the Deams took a Heath factory tour as part of a brainstorming session, where the team realized that creating a line of tile, instead of one of Heath's pottery or tabletop sets, was the obvious choice, says Bailey. "It seemed like it would resonate with the architecture and structural ideas that a Dwell reader could be excited about." Plus, tile possessed a timeless, more permanent essence that appealed to both audiences. "Heath's focus is on products that last a lifetime, and thinking about design as something that will grow with you," she says. "Dwell has that philosophy, too." Catherine Bailey and Christopher Deam examine a tile board at Heath's factory. The mission to create a line of architectural tile was handed over to Christopher Deam, who actually began his explorations in a very surprising place: The grout line. "Typically architects and designers are trying to minimize the grout line," he says. "But I saw it as an opportunity to be an expressive part of a composition." Using the line as a leading design element gave way to exercises in non-orthogonal, or non-right angle, pattern-making, which would create more options than a simple square or rectangular tile. "After a lot of refinement I was particularly excited that the shapes work in different arrangements to give radically different looks," says Deam. 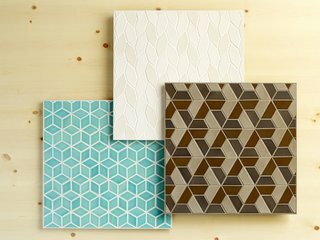 While Heath has created tile in three-dimensional shapes, this is the first time they have combined flat tile with color options to create stunning 3D-looking patterns. Even though the system consists of only three shapes—a diamond, a small hexagon and a large hexagon—the shapes can be configured into five different combinations, and with the addition of any of Heath's dozens of glazes, the possibilities become endless. While the challenge of spatial relationships coupled with good old-fashioned trigonometry might make some designers' heads explode, Deam had a trick up his sleeve: He actually started college as a math major. "Combine that with design and architecture, and 3D thinking comes pretty easily for me," he says. "Tell that to kids when they don't want to do math homework." The tiles are made from the same vitreous clay formulated by Edith Heath a half-century ago, which is safe for indoor or outdoor use. While its detail and proportion makes it especially interesting for a tiny space like a backsplash, the tile was made to scale out to cover the entire side of a building. Those in San Francisco will soon be able to see an example at Cowgirl Creamery’s new Ferry Building tasting room when it opens in July. A honeycomb pattern will use a variety of creamy, cheese-inspired white glazes. More options that play with shapes and colors, including an inventive 3D pattern by Deam. But as soon as next week, fans will actually be able to get their hands on the new Dwell Patterns tiles: A table set up at Dwell on Design will be covered in hundreds of loose tiles for everyone—from math majors to mosaic artists—to design their own custom creations. Although the five patterns created by Deam can come face-mounted for easy installation, that doesn't mean there aren't more options that savvy homeowners won't uncover themselves, says Bailey. That DIY spirit is another key factor that makes Dwell Patterns so appropriate for a Heath-Dwell partnership. "Dwell presents design as something you have to get involved in yourself," she says. "Our customers respond to the same kind of great design." Dwell Patterns by Heath will be part of the exhibition at Dwell on Design which is taking place June 25-27 in Los Angeles. Register for Dwell on Design now!